In our first blog post on the topic, we covered the top five pieces of advice every new photographer should know before starting their business. In this blog post, we will cover the five most important things to know in the beginning days of your new photography business. Starting a new photography business can be one of the most rewarding experiences for someone who is passionate about photography. But, like starting any new business, it can be hard to know what to do first, and what is most important to focus on. Not to mention the nerves you may have working with unpredictable newborns and learning how to best handle them. Newborn photography is like no other form of photography but can also be the most rewarding! In an effort to help all the newbie photographers out there, we consulted the experts! As a photo prop company, we work with the best of the best every day. Recently, we spoke to over 20 veteran photographers from across the US and we came up with 10 things every photographer should know when starting their newborn photography business. Here is the second part of this topic, five things to know once you have started your business. If you focus on just one thing in every session, it should be safety. There is nothing more important than putting the baby in a safe environment and doing poses in the safest way possible. Some photographers even suggest speaking to medical professionals who work with newborns to better understand how their bodies work and what they are capable of. It is also important to recognize that all babies are different and will react in different ways. If you have a pose that a baby is just not comfortable with, stop. Working with each baby on an individual basis is key, which means you must be adaptable to keep the newborns as comfortable as possible. It is important that a parent is always close by, even for the safest poses. Newborns are unpredictable but learning how to prep the baby for the shoot is crucial. Make sure mom and dad bring their healthy baby with a full belly and sleepy. Also, let the parents know it is best to loosen up diapers and clothing 30 minutes before a session to avoid any marks on the baby’s skin for naked poses. Prep mom and dad on what to expect for the baby, and what you expect out of them, so everyone is on the same page going into the session. Best age is within the first 10 days when babies are still nice and flexible. Once you have all those points, make sure your studio is set and ready when the newborn arrives. Have the heat up to make the baby as comfortable as possible and a white noise machine going. Be prepared for poop too! We hear that many photographers like to utilize puppy pads of all things! Just because you are new to the game, it doesn’t mean you should be too scared to use a contract. Contracts are beneficial for both the photographer and client. Contracts set boundaries and inform all parties of legally required duties and help enforce ground rules. Since you are working with precious 10-day old newborns, contracts are even more important. 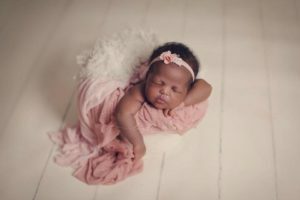 Besides the basics of payment, cancellation policies, copyright law etc., newborn photographers should also include extensive reflection on baby prep, age-guidelines, and bookings. I can’t tell you how many times a new photographer in a photography group has been has been panicking because their customer is demanding a refund or is editing their professional images with filters on Instagram! Having a clear and concise contract will eliminate a lot of headaches! Ultimately, every newborn photographer needs to have patience. If you are rushed and stressed, the baby will feed on that energy from you and the parents. Don’t force a baby into poses if they are uncomfortable or fighting it. Move the baby slowly and carefully and be willing to give a baby time in between poses. Remember, newborns are very new to the world, and these are all new and overwhelming experiences for them. If a session takes a few hours, that is ok. No need to rush those precious moments! Do you have any other advice we missed? Let us know down below in the comments.